← Why Loiter? Is Mumbai an ideal city to loiter in? Blue Frog by Serie architects is located in Bombay’s old mills district. It is housed in a warehouse that has been transformed into an acoustic lounge that also serves as a restaurant, bar and live music venue. Staggered booths carved from an undulating surface at various levels provide privacy as well as uninterrupted views of the stage. At night the translucent surface is illuminated from beneath with LED’s. During the day the space is in stark contrast to what it looks and feels like at night. The industrial roof allows for plenty of natural light to penetrate the space and set the stage for an exciting brunch. I had been longing for brunch at Blue Frog for a long time now and was glad that we finally went there on the last Sunday of last month. 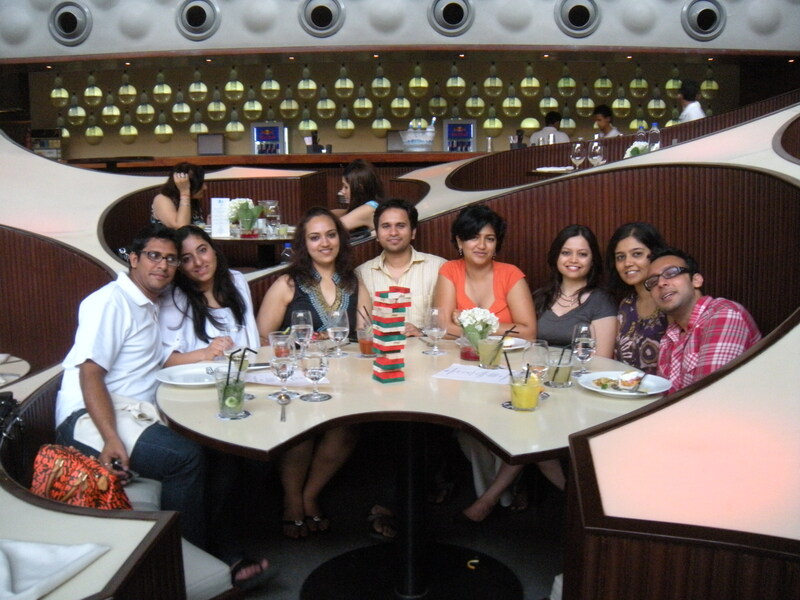 This time we had friends from Bangalore and Dubai joining the Bombay Brunch Brigade. We missed a few regulars but I am sure after they read this review they will realize that they missed something really good. I started off with the Cucumber and Mint cocktail, followed it up with The Musky Melon. We could not wait to eat – we made our way to the bar where a spread of salads and cold cuts awaited us. The jerked potato wedges, a beef salad and the cold green gazpacho was refreshing with the freshness of spinach, parsley and mint. Then the friendly and attentive staff asked us for our eggs, pancakes and waffles order. I tried the waffles after they had gone cold so they were not as crispy but I had the pancakes with a berry compote and it was nice and fluffy. Then I shared a made to order omelet and it was good as well but the egg benedict that a friend ordered looked more exciting. Around this time the live music had begun. I was looking forward to some foot thumping music so that we could dance as well but the music was more in tune with what brunch music should be. 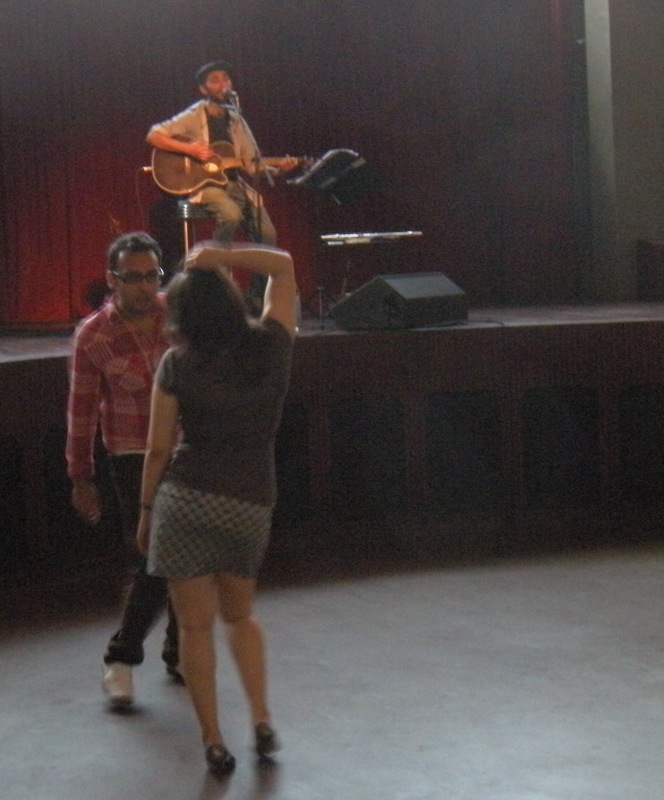 It took us some time to warm up to Neil Gomes who is also a singer-song writer. We were entertained by his take on the Nirma washing powder and saridon ads of the 90’s. Later in the afternoon he delighted us by playing Britney Spear’s, “Baby Hit Me One More Time.” Gomes is also multi talented he played the violin, saxophone and the flute exceptionally. The drinks and food continued, for the main entrée I had called for the charred chicken with peppers from the grill which was smokey and well spiced. By now I am informed that we have run them dry on their melon cocktails so I switched to the dawn (orange and vodka). 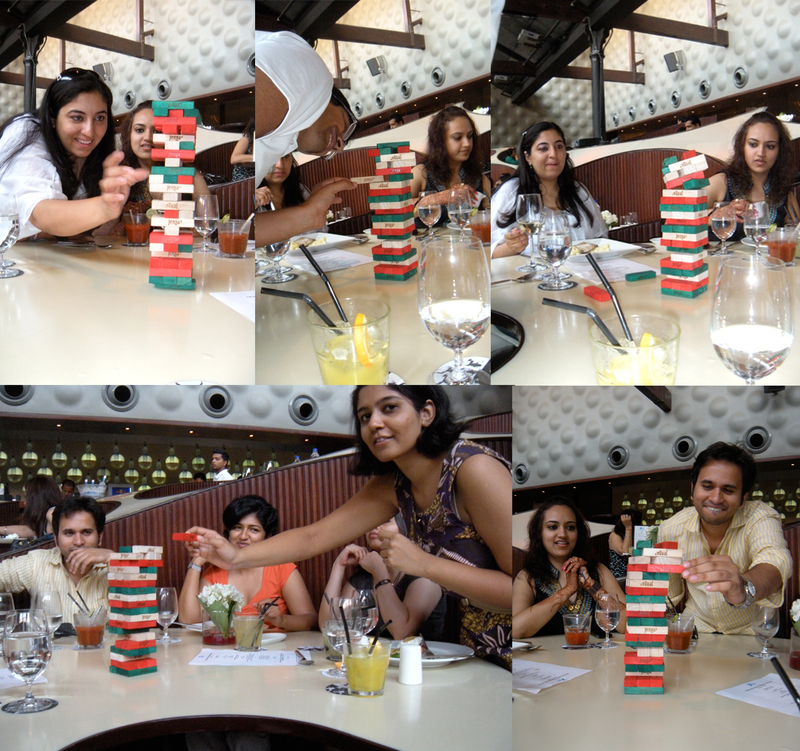 Somewhere between all this excitement we started playing Jenga. and that turned out to be a lot of fun. We played a twisted version of Jenga and while many revelations were made some members of the brigade shied away. There was an array of desserts but the bite sized marble cheesecake was the winner for me. This was a much-needed elaborate brunch. The service again here is excellent. I made sure to go talk to Neil and thank him for entertaining us – he was kind enough to come by our pod and meet us all. This is what I call a perfect brunch in the company of good friends, food and booze! A special thank you to friends that joined us from Bangalore and Dubai you will be dearly missed at the next one. Bombay Brunch Brigade meets once a month. The purpose of this group is to meet – have fun, find a travel partner, a date (may be), share brain farts and savour brunches. We will be exploring different brunch places all over Bombay. Join our Facebook group for the next brunch date and location information. This entry was posted in Architecture, Culture, Design, Fashion, Food, Travel and tagged Blue Frog, Bombay, Bombay Brunch Brigade, Lower Parel, Mumbai, Neil Gomes, Serie Architects. Bookmark the permalink.